what astonished me is not only the portion sizes but the fact that there is an entire show with 4 series based on 1 American man taking on some of the biggest food challenges in the world. What's worst thing is that I'm obsessed with the show, so when I realise that there is a massive burger challenge right here in my home town I am there. It's called Misty's diner and its located on high street in Prahan, this place is great! It is like stepping back into the 50's into a scene from grease. Ok so I will leave the next bit to you and although I can't guarantee that Mr Travolta will be there...i can tell you that it won't be disappointing. It's a fun place with great food from burgers to hotdogs, chilli fries to BBQ ribs even peanut butter milkshakes to deep fried twinkles if its American they have it. 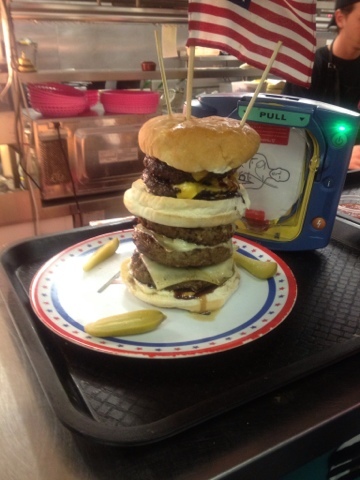 The ULTIMATE BURGER CHALLENGE !!! You have 14min to eat an entire 5 beef patty tower if you will that is a 1.2 kg slab of meat, along with 200 gr of chilli fries ! Now call me crazy but it was impossible , well for the 3 people attempting it that night it was but I have been assured that quite a few have succeeded and received the "I bet Misty's burger challenge" T-shirt and there photo on the wall of fame. Now I chickened out and instead of the challenge opted for something a little less messy... BBQ pork ribs and buffalo wings with home style ranch dressing haha get it?? It was sensational and to top it off finished with a chips ahoy or choc chip cookie thick shake served with delicious whipped cream and crumbs of cookie over the top. Extravagant and fattening but worth it. It's one of those places you have to experience to believe it.